Considering the amount of rain we’ve received here in Toronto lately, I thought it would be appropriate to serve up some fish dishes this week, in honour of the creatures that we will soon all turn into! Today’s dish, is one of those that looks elegant and fancy, but can be made any weeknight in a hurry. The simple act of poaching the fish in the sauce makes for a flavourful, moist dish that you won’t have to worry about overcooking. Worst case scenario? You leave the fish poaching too long, and it breaks up… and you have fish stew instead! See, it’s all good! I hope you enjoy this cod dish. It will serve 6. * If you don’t want to use wine, you can substitute with an equal measure of water with a little powdered consume added for flavour. ** Click here to learn about cleaning parsley. Place the wine, water and saffron threads in a small saucepan and let steep over a medium-low heat while you work on the rest of the dish. In a large skillet or pan with a lid, heat the olive oil over medium-high. Add the garlic and onions, and sauté until they become slightly translucent and fragrant. Do not brown. Add the bell peppers, squash and tomatoes, along with about ¾ teaspoon salt and ¼ teaspoon pepper. Cook until the tomatoes have broken down, and the sauce has thickened, about 10-12 minutes. Once the tomatoes have broken down, add the wine mixture to the pan, along with the drained and rinsed beans. Stir to combine. Season the fish on both sides with salt and pepper, and then gently place them on top of the liquid/vegetable mixture. Cover and simmer until the cod is opaque throughout, about 7-9 minutes. To serve, ladle some of the vegetable/bean sauce into the bottom of a bowl, or deep dish, and then top with the fish, along with some more of the sauce. Garnish with fresh parsley, and serve with crusty bread. Dice the fish into an approximately ½-inch dice. Marinate fish in the lime juice in the fridge overnight (this step cooks the fish). I would suggest marinating the fish in a large gallon sized freezer bag, as it makes clean up a cinch, and you can shake the bag up often to make sure the fish is evenly “cooking”. The next day, pour off most of the lime juice, leaving just enough to keep the fish moist. A few hours before serving, mix together the tomatoes, green peppers, ½ cup of the chopped parsley/cilantro, jalapeno peppers and onions in a large bowl. In a small bowl, mix together the salt, pepper, oregano, vinegar and Tabasco sauce. Add the fish to the large bowl, and gently mix together, making sure not to break up the fish pieces. Pour the dressing on top of the mixture and toss, gently, to coat. Keep refrigerated until ready to serve. About 15 minutes before you are ready to serve, remove the ceviche from the refrigerator so that it is not ice cold. 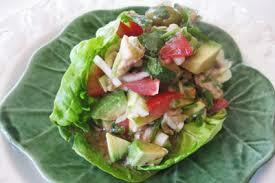 Arrange the lettuce leaves in individual serving plates with a serving of the ceviche. Garnish with sliced avocado and remaining parsley/cilantro. * Click here to learn how to properly check these ingredients. This salad is to be served on top of the chicken cutlets, as part of the dish, not as a separate salad/side dish. Make the Cotoletta (cutlets) as per the previous recipe (click here). While the cotoletta is cooking, make your salad by putting your tomato in a mixing bowl with a bit of salt. Allow the tomato to macerate for just a minute or two, then drain out the excess liquid along with most of the seeds. Take the pulp, mix it with the basil leaves and toss with the olive oil. Adjust for seasoning. Serve the cotoletta, still hot, with the tomato salad spooned over the top, and eat it right away! Note: If you cannot find ripe large tomatoes, try changing to cherry tomatoes instead; you will need about 2 pints for this recipe. * click here to learn how to properly clean basil.